October 7th saw a sounding rocket launch from NASA’s Wallops Flight Facility — short ballistic trajectory up into space and back down — to test new systems for future launches. Partway through flight the rocket released a cloud of tracer gas into space, 130 miles above the Earth. We watched the launch from North Virginia. I tried to get a long exposure of the first and second stage firings, but the arc, while clearly visible to the naked eye, was lost by the camera to the still-bright twilight. 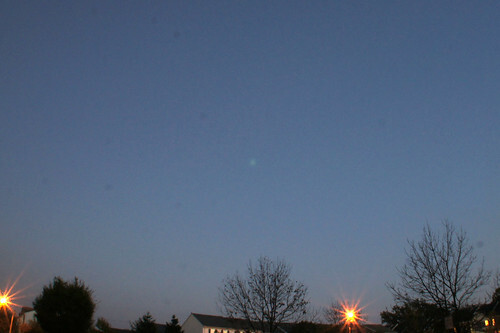 The tracer gas release was definitely visible, however: a rapidly expanding puff of green vapor which reached the size of a full moon before slowly fading away. Not quite as spectacular as the multiple plumes of ATREX, but still impressive.